Instinctively, a young boy is inclined to dislike batting gloves. They feel clumsy and prevent his skin from making contact with the bat handle as he would desire. But the young boy should get over this feeling quickly, as no batsman can afford the risk of batting without gloves. Moreover, they help increase one's confidence by leaps and bounds. There are various types of gloves. 1. Gauntlet type gloves with cotton palm and tubular back. In these gloves, the hand fits right into the glove and there is no direct contact between the skin of the palm and the bat. They are most widely used. 2. Open palm gloves with kid finger stalls and tubular back. Some cricketers wear open gloves with a thin pair of ordinary white cotton gloves underneath, which can be changed when wet, thereby saving the main pair of gloves from getting wet. 1. The palm of the glove is not worn out, in which case the bat will slip from the hand. .
2. To change the gloves while batting if they have become wet with perspiration. 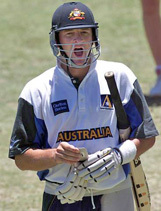 No batsman should take the risk of playing without an abdominal guard. They give confidence as well as protection. They are made of aluminium or plastic and will withstand a very hard blow without damage. 1: Guard attached to a strap round the waist. 2: Jock strap with a pouch into which the guard fits. The advantages of the second type is that it can be slipped in at the last moment before going in to bat or taken out in a second at intervals and it cannot get out of place. Nowadays, it is common for a batsman to wear a thigh pad. It consists of an oblong piece of sponge rubber fitted into a cloth bag, and is worn to protect the outer portion of the front leg between the top of the pad and hip. The pad is not very thick (say about half an inch). It is light and held in place by thin tapes tied round the waist at the top and round the leg at the bottom. Without a thigh pad there is a tendency to get the body right inside the line of flight and run the risk of being caught behind from a very fine glance. With the thigh pad on, the batsman may be willing to stay more on the line of ball and take the ball if necessary, on his thigh with confidence, particularly when the fielders are placed very close on the leg side. Wicket Keeping Gloves inner and outer The inner gloves should be put on slightly damp .and the outer gloves should then fit snugly over the top. Normally they are stiff and require to be worked in by a fair amount of practice so that they become pliable and form a cup into which the ball snugly fits. Gloves need to be faced. The rubber surface tends to become shjny and slippery so a preparation is often used to make it slightly tacky. This mixed preparation is available in sports shops.